Ligand-biased signaling could have a significant impact on drug discovery programs. 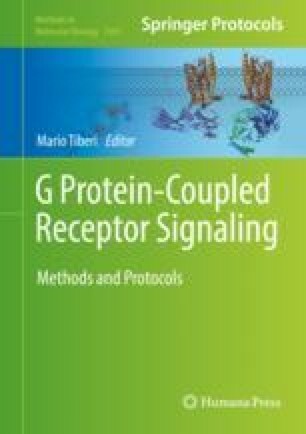 As such, many approaches to screening now target a larger section of the signaling responses downstream of an individual G protein-coupled receptor (GPCR). Biosensor-based platforms have been developed to capture signaling signatures. Despite the ability to use such signaling signatures, they may still be particular to an individual cell type and thus such platforms may not be portable from cell to cell, necessitating further cell-specific biosensor development. We have developed a complementary strategy based on capturing receptor-proximal conformational profiles using intra-molecular BRET-based sensors composed of a Renilla luciferase donor engineered into the carboxy-terminus and CCPGCC motifs which bind fluorescent hairpin biarsenical dyes engineered into different positions into the receptor primary structure. Here, we discuss how these experiments can be conducted and combined with CRISPR/Cas9 genome editing to assess specific G protein-dependent and -independent events. The work was funded by a grant to TEH from the Canadian Institutes for Health Research (MOP-130309). KB was supported by an internal Faculty of Medicine Studentship from McGill University.